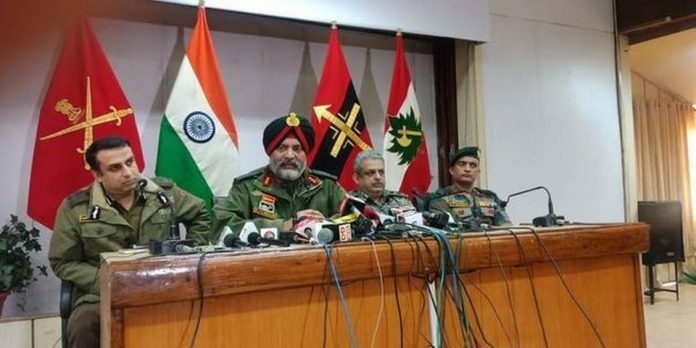 Kanwal Jeet Singh Dhillon, Commander of the Army’s Srinagar-based 15 Corps, on Tuesday said the security forces eliminated Jaish-e-Muhammad leadership in Jammu and Kashmir in less than 100 hours of the Pulwama car bomb blast. The 15 Corps, also called the Chinar Corps, mans the Line of Control (LoC) in Kashmir. “We have eliminated the JeM leadership in the Valley, which was being handled by JeM from Pakistan. The type of car bomb attack that took place in Pulwama on February 14, happened after a long time in Kashmir. We will keep all options open to deal with these kind of attacks,” said GOC Dhillon. Mr. Dhillon was speaking at a joint press conference with Inspector General of Police S.P. Pani and IG CRPF Zulfikar Hassan in Srinagar. The GOC said the Army has leads on the type of explosives used in the Pulwama attack but refused to share the details “as an investigation is underway”. Referring to the Pulwama encounter on February 18 that left five security personnel dead, the Army officer Brigadier Hardeep Singh, who was on leave due to injury, cut short his leave voluntarily and came to the operation site and stayed there and lead his men from the front. Mr. Singh was also wounded in the Pulwama encounter. The Army officer asked the mothers of Kashmiri youth to request their sons who’ve joined terrorism to surrender and get back to mainstream. “Anyone who has picked up gun will be killed and eliminated, unless he surrenders. Our focus is clear on counter-terrorism operations. We are very clear that anyone who enters Kashmir Valley will not go back alive,” he said. IGP Kashmir Pani said there was a significant dip in recruitment in the last three months. “The families are playing a huge role in this. We would like to urge the families and the community in curtailing recruitment,” he said. Meanwhile, CRPF’s Hasan said our helpline-14411 has been helping Kashmiris across the country in wake of this attack. “A lot of Kashmiri students have approached this helpline for assistance all over the country. All Kashmiri children studying outside have been taken care of by security forces,” he said. Two non-local Jaish terrorists were killed in Pulwama on Monday and were identified as Kamran alias Fahad and Rashid alias Gazi alias Lukaman, both from Pakistan. A local militant, Hilal Ahmad, was also killed. The Army on Tuesday said they were involved in the February 14 attack on CRPF convoy at Lethpora, in which at least 37 jawans wers killed.